An invading force is coming to Ansonia ... all in good fun for this year's Midsummer Fantasy Renaissance Faire - every weekend from June 18 to July 4 at Warsaw Park - where history and imagination converge to create magic. "We're a big bunch of geeks. We've got dwarves and elves and fairies and goblins and run-of-the-mill humans," said Daniel GreenWolf, a professional magician and the faire's general manager. "The storyline this year is big. The whole village is involved. There are 150 costumed characters and every character in the field has a stake in it," he said. Visitors to this magical realm can expect live combat with more than 40 trained, choreographed fighters armed with swords and other weapons related to renaissance and medieval times. GreenWolf calls it "an other-worldly experience" that is fully integrated throughout the day from the moment a person enters the grounds until the moment they leave. "You can walk up to any character and they will share the experience with you. They stay in character all day long. The whole park is considered 'on stage,' even for the Trash Trolls (garbage patrol)" he said. In addition to the overall theme and related performances the faire will have 20 musicians, singers, magicians, storytellers, jugglers, and 50 artisan vendors and crafters including a blacksmith, a leather worker who makes suits of "armor," and a potter who will offer viewers a demonstration of the craft. "It's a craft fair on steroids," GreenWolf said. Among the performers who will make appearances this year are the Crimson Pirates, a nationally renowned singing group, and Paolo Garbanzo, winner of an annual worldwide jester competition. The Questless Company will offer "a mix of exciting sword fighting, ridiculous stunts and nerdly humor." The World of Wyck will provide sideshow stunts and off-the-wall seen-to-be-believed comedy. Granny Gruesome's Gleeful Tales will bring "wacky fun for all ages, with a zany vegetarian zombie." Hvbris will unleash its wickedly creative antics and amaze the audience with their dangerous delights. 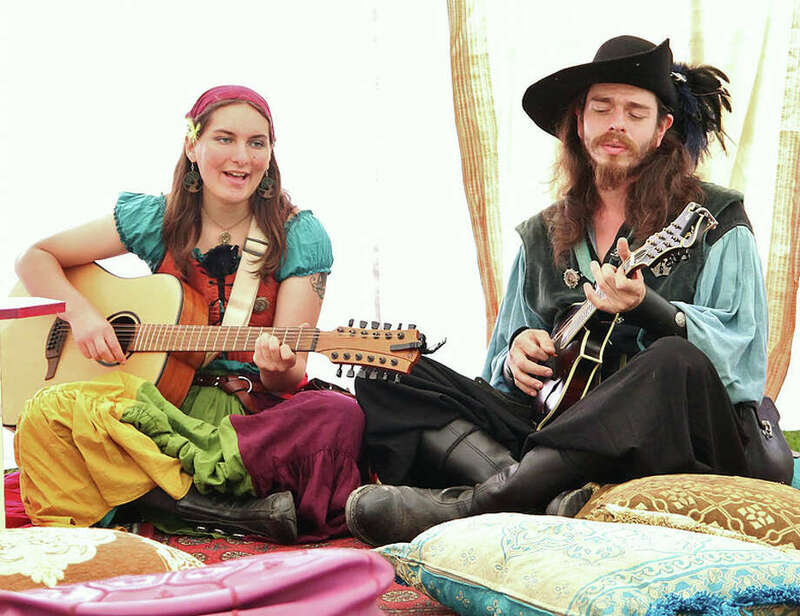 Other performers include the Knights of Gore, The Harper & The Minstrel, Blackjacks 'n' Blarney – the pirate drinking group with a Celtic singing problem, Thyme Awaye – a Celtic folk songstress with a hauntingly beautiful voice, and Three Pints Shy – a raucous pub band. The professional performers will be joined by local volunteers who audition to participate. "We train them with improvisational workshops, acting training, all the skills they need to help us create this world," said GreenWolf, who also performs his feats of magic and fire-eating. GreenWolf has been voted one of the Top Five Solo Variety Acts in the United States by the Renaissance Festival Podcast and Renaissance Magazine five years in a row. In addition to the interactive shows there will be children's games and people can try their hand at games of skill including archery and a knife and axe throw. And of course there'll be the food court with appropriate faire fare such as turkey legs and beef on a stick. The Midsummer Fantasy Renaissance Faire is a rain-or-shine event. "We perform no matter how many people are there or what the weather is," GreenWolf said. But if it is raining those who attend will have a dry seat. The stages are under tents. For more information and tickets visit www.mfrenfaire.com.